Magic takes place in the kitchen. Families gather around the dinner table to enjoy the delicacies created there. Sometimes, though, creating the magic becomes very difficult when trying to locate utensils that are hidden in the backs of drawers. Cluttered countertops can take away some of the magic as well. Fortunately, though, a number of people have come up with great ways to contain clutter and organize small items so that they can be easily found. Simply applying a little bit of order removes the chaos and brings the magic back. 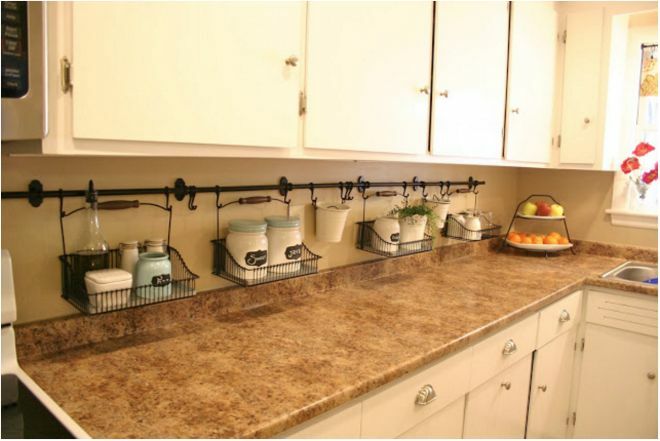 The ideas below can help "free up" space in your kitchen and restore order. Disclaimer: We support our readers with thoughtfully chosen product recommendations to improve life at home. You support us through our independently chosen links, which may earn us a commission. Placing utensils in empty tins keeps the utensils from getting lost in drawers. This also makes great use of vertical space that would otherwise go unused. 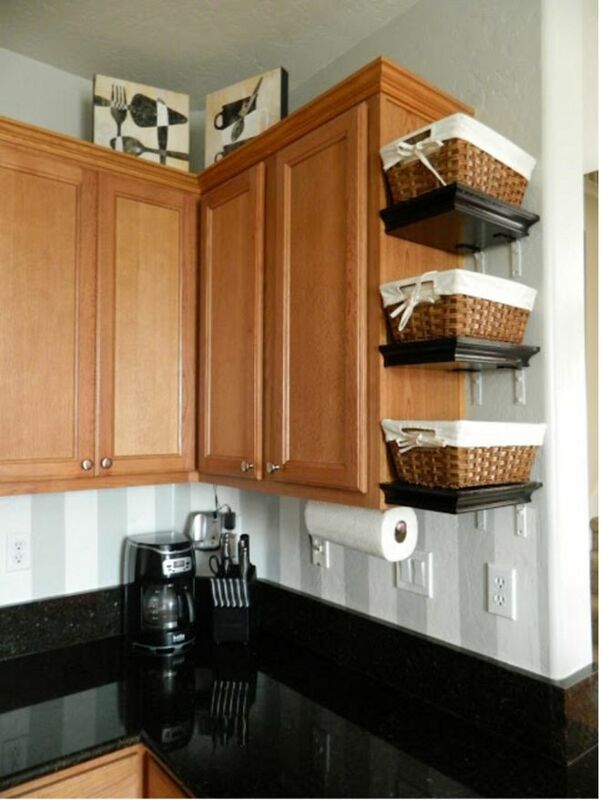 Using baskets to gather various tins and small containers in one area helps to organize countertops as well. 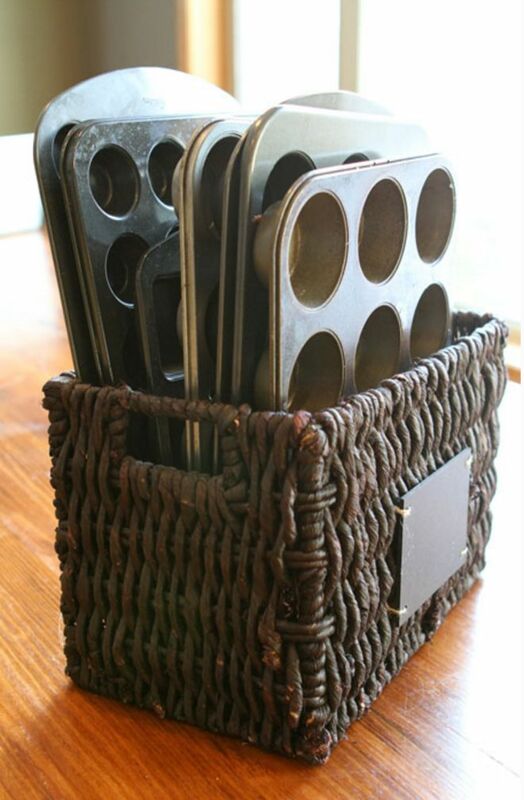 Need a tray organizer like the one above? Similar one here. A super chic one is here. 2. A file organizer to keep foil, plastic wrap, and others under control. 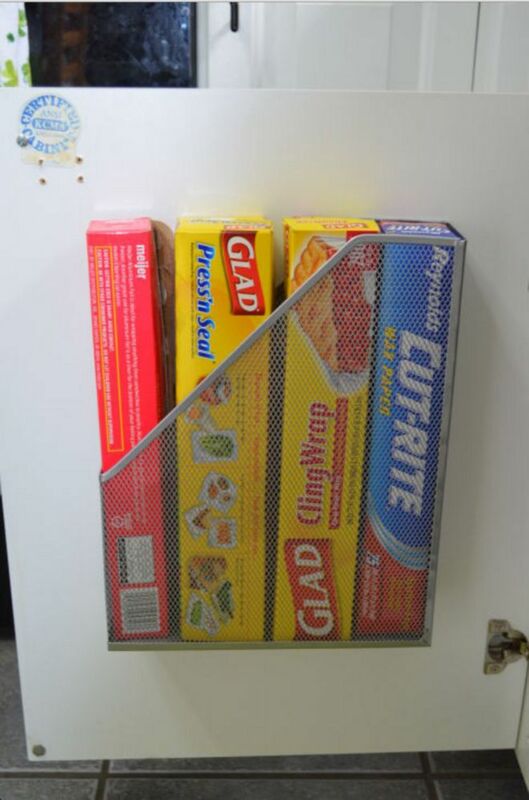 Attaching a file organizer to the inside of a cabinet door makes a great place to store foil, plastic wrap and wax paper. 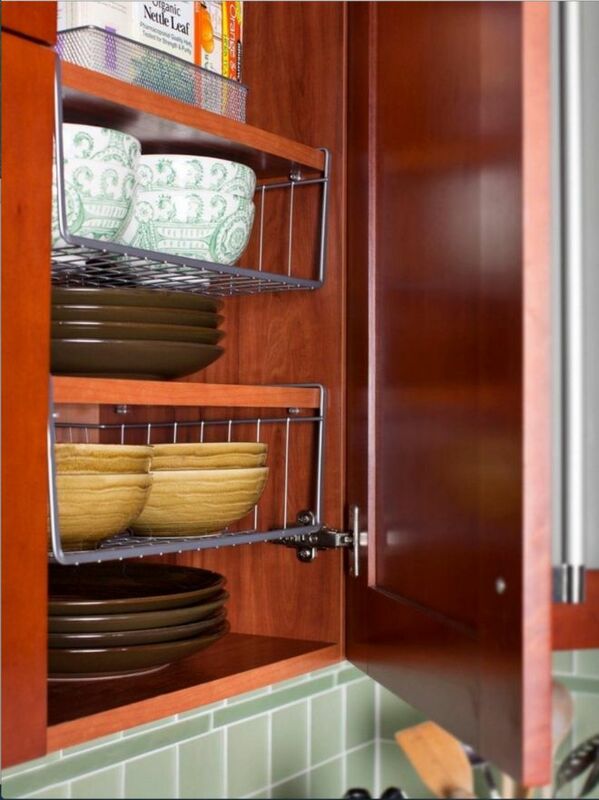 This makes use of otherwise wasted space and frees up more cabinet space. 3. 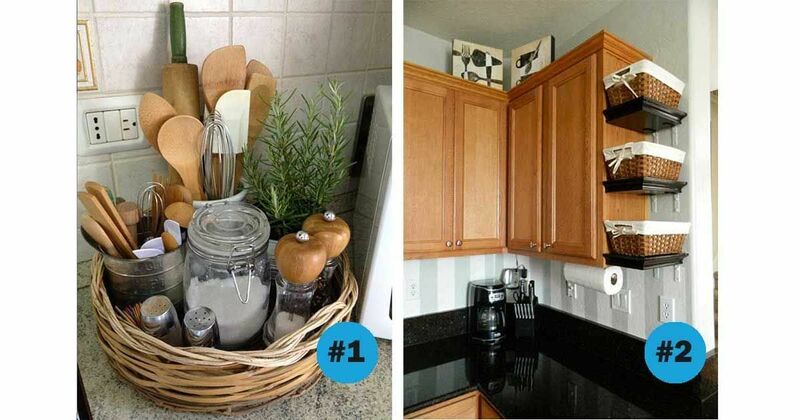 Baskets add space to small kitchens, by My Perfect Nest. Often times, the ends of cabinets go unused. Attaching shelves to either the cabinets or walls gives additional space to place baskets or containers for sundry kitchen items. Interested in purchasing a basket? A similar one is here. Another here. Smaller version here. 4. 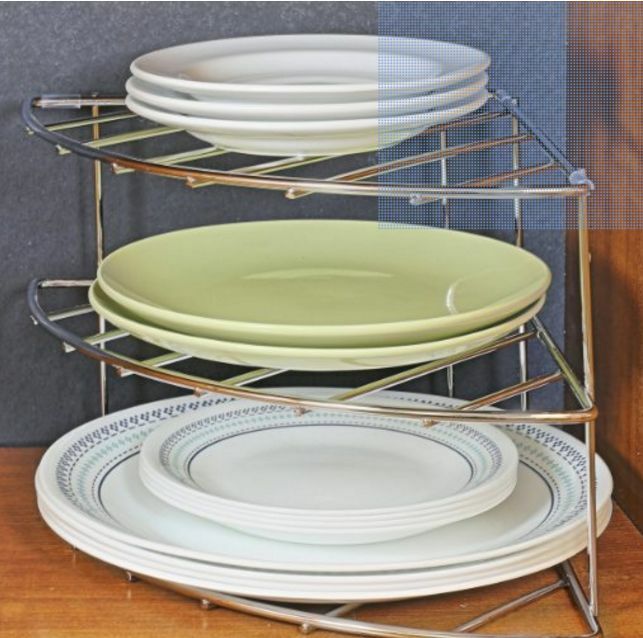 Decorate, save space and organize with this serving plates display by Oliver and Rust. 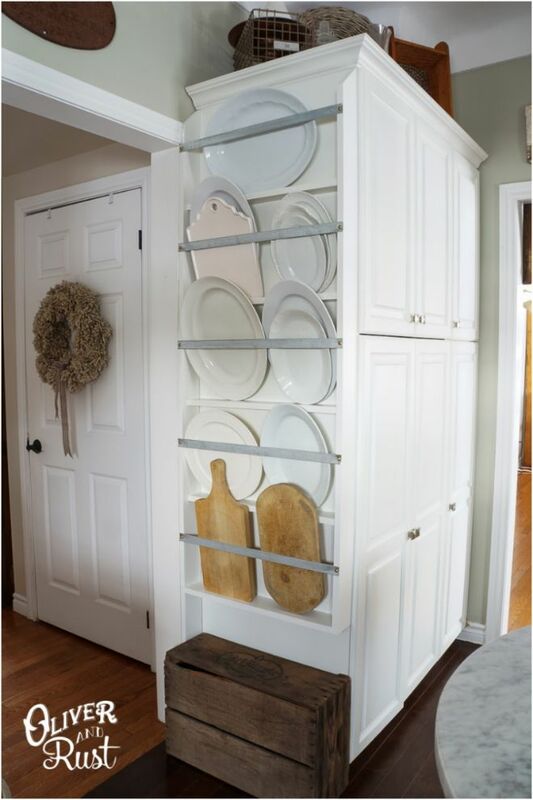 Another use for the cabinet end is building custom shelving to hold plates and platters. With these on the outside of the cupboard, the inside can be put to use housing other items. Need a serving plate? One to buy here. 5. 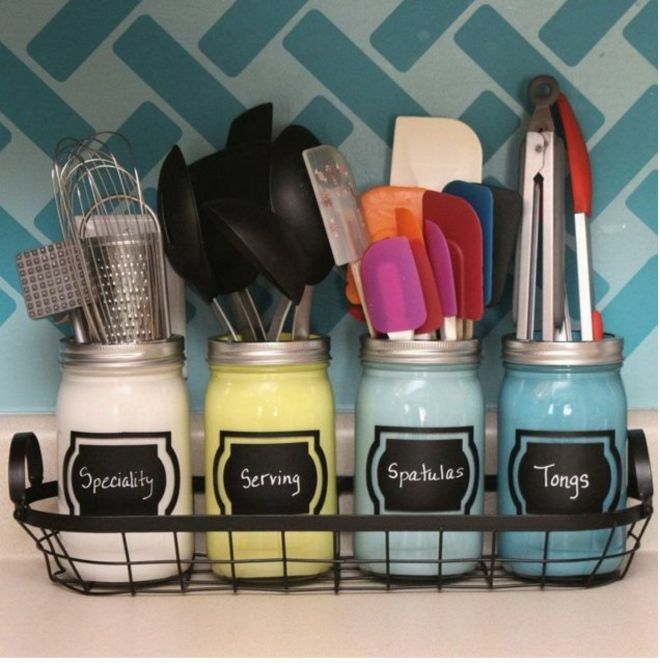 Mason jars keep utensils tidy, as shown by Megan Duesterhaus. 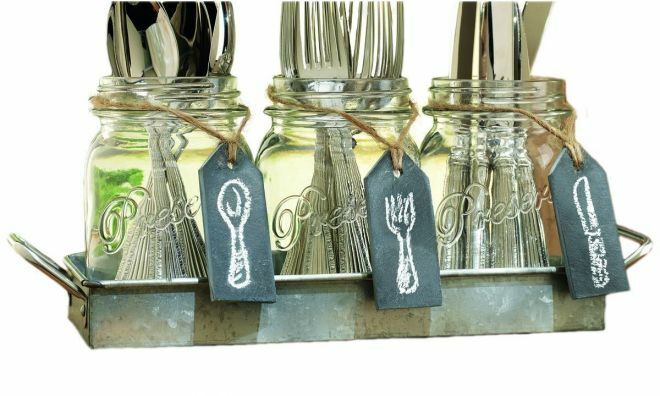 Mason jars are great for holding utensils. You can separate the items out by category for further organization. If you don't like the looks of the plain jar, you can decorate it by placing decorative paper on the inside or painting it with sidewalk paint. Need mason jars? Purchase here. 6. Undershelf baskets by HGTV. Stacking items on a shelf too high can be dangerous. By adding a hanging basket, you create additional shelves. Baskets also keep small items neatly contained and easy to pull down and work with. Similar one available for purchase here. 7. A cutting board with a hole makes cooking so much easier, by The Kitchn. Often, when a cutting board gets damaged, it gets chucked. 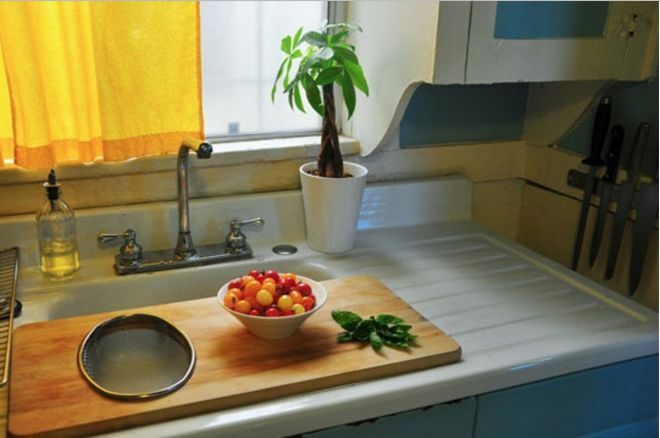 Instead, cutting a hole in the board makes a great place to put a bowl or colander. The board sits over the sink, and the bowl or colander sits in the sink, waiting to be filled. Need a long cutting board? Similar one available for purchase here. 8. 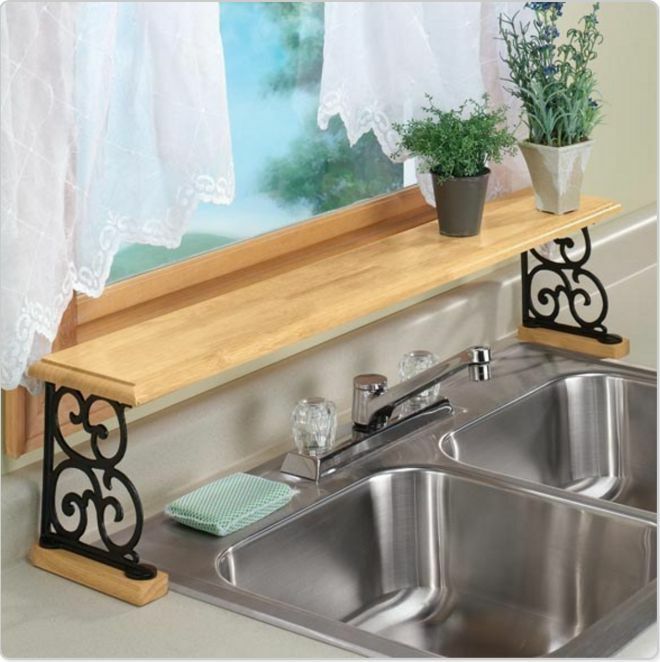 An over-the-sink shelf maximizes the counter space, by Buzzfeed. Placing a shelf over the sink gives you a spot to place soap, lotion, cleaning brushes or herbs. Interested in over-the-sink shelves? Purchase a similar one here. Another chic variation here. 9. Basket caddies also keep the counter extra tidy, by No 29 Design. 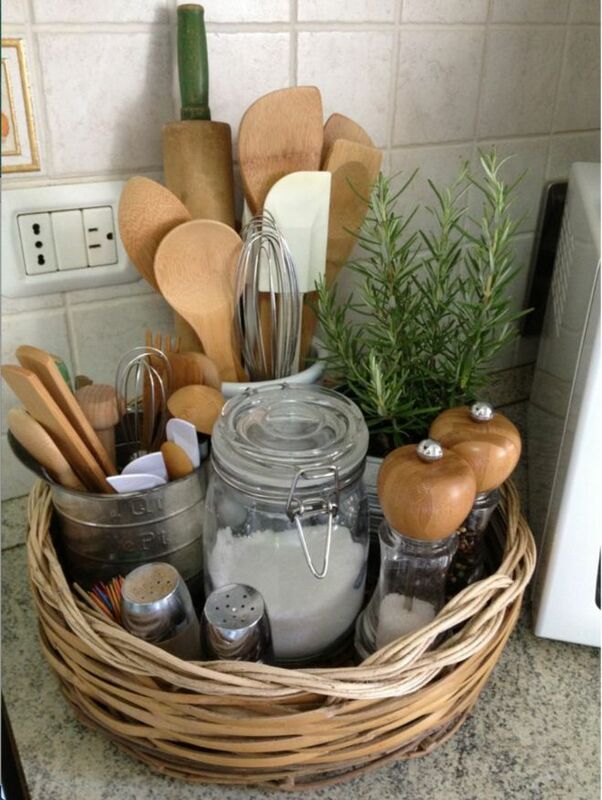 The Fintorp rails from IKEA are a great way to suspend baskets for storage and clean up your countertops. You may be able to achieve the same effect by using dowel rods or small curtain rods. Interested in basket caddies? A potential option here. 10. A shower caddy becomes a produce rack in the hands of Domestic Diva. Just because the item says "shower" caddy, people assume it can't be used anywhere but in the shower. 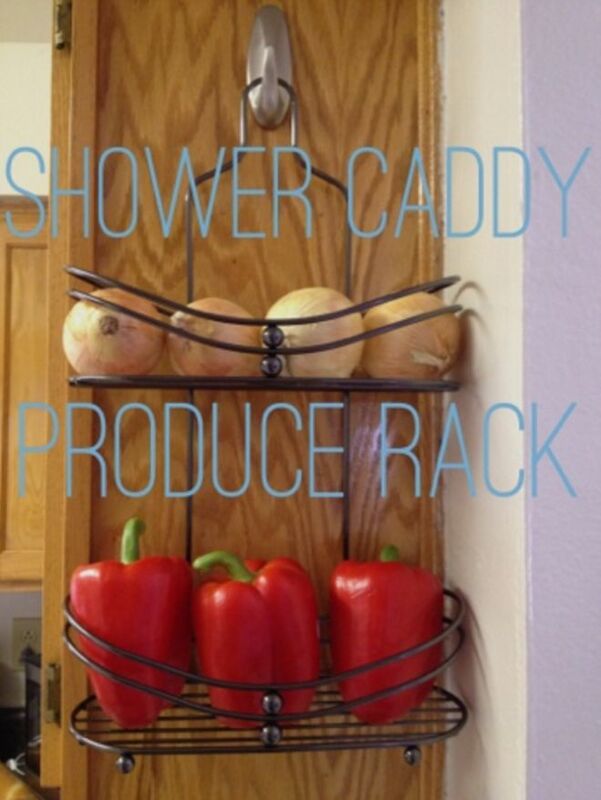 Often, hanging a shower caddy from a hook in the kitchen turns it into a great veggie or fruit rack, or a spice holder. A similar one available for purchase here. 11. I Am A Baker uses baskets to organize her baking utensils. Since vertical space often goes unused, placing baking sheets and tins in baskets where they can stand on end makes great use of vertical space and frees up the horizontal for other items. 12. Eliminate dead space with a corner shelf, as shown on Apartment Therapy. Corners are another "dead" spot in rooms. Shelving units, especially with various heights, can turn the wasted space into useful space. 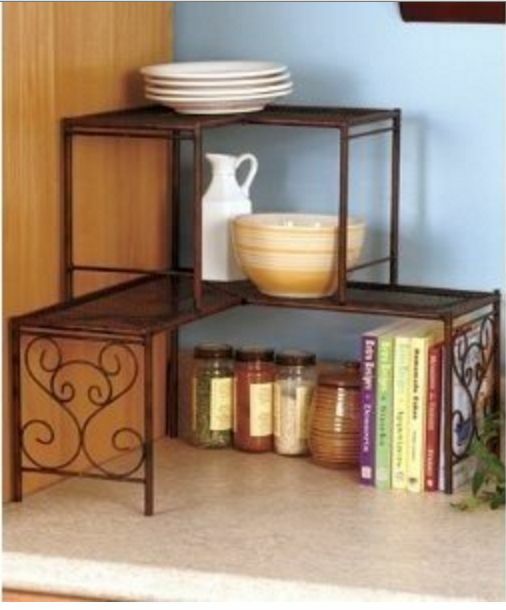 Interested in a corner kitchen shelf like the above? Exact match available for purchase here. 13. 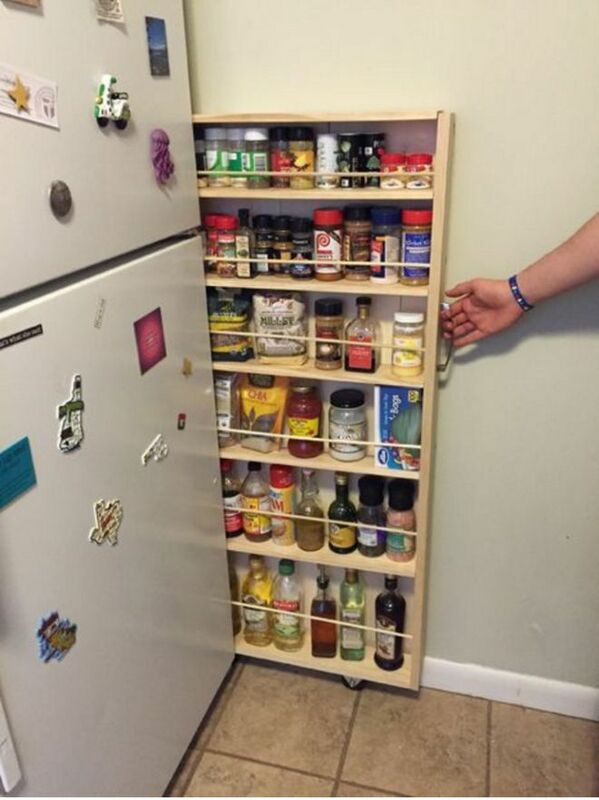 A DIY, slide-out pantry saves so much needed space, by Instructables. If you have space between the refrigerator and wall, then building a custom rack that slides into that space may be a great way to put the area to use. Since spices generally come in small containers, making the custom rack a spice rack frees up valuable cupboard space for bulkier items. Interested in the hidden slide out pantry like one above? Buy it here. With a little bit of time and effort, you can take your kitchen chaos and restore it to order. Once that is accomplished, the "magic" may return. You typically find Borax hidden amongst the laundry detergents, but did you know about this use for it? Looking to give your kitchen a makeover? Here's a painting shortcut — and the payoff is gorgeous. Whether you have a tomato garden, or just like to save money by buying in season, you can benefit from huge savings and cut out food waste with a few simple steps. The weather is warming up and the season for sandals is quickly approaching. This is not what most people imagine when thinking of cattle.